Hello there. Thanks for stopping by. I’m currently a print journalism student at the University of Houston, and one day I’d like to work for a large metropolitan newspaper. I bet that sounds silly to you. According to the State of the News Media 2014, newsrooms – we’re talking newspaper gigs here – went down in size by 6.4 percent in 2012. The American Society of News Editors reported a loss of 16,200 full-time newspaper employees from 2003 to 2012. Ad Age said that more than 38,000 magazine jobs disappeared during that same time period. That’s a lot of print jobs. What does that mean for my big-time metro newspaper job? According to that same report, several online-only news media have popped up and high-profile journalists are joining this digital revolution. Online media is a thing and it’s not going away. New ways of storytelling and reporting are being discovered, from using video and images to live-tweeting events. Journalists are expected to know how to use a multitude of software such as Photoshop, Final Cut Pro XL and especially all the social media, from Twitter and Instagram to Facebook and Reddit. Being a journalist these days requires a lot more responsibility and multitasking than ever before! So I ask again. What does that mean for me? Basically, it means that not only will I be a print journalist, I’ll also be an online journalist. I’ve already had experience with this. The reporters at the Chronicle know that the stories they write will go up immediately on the web. We’re trained to get stories up as soon as possible. So in essence, these print journalists are writing for the web first. We’re already online journalists and we’re doing all the things that journalists are now required to do. This is why I’m not worried about not finding a job after I graduate. Maybe I’m a bit naive. But I’m not alone. The other day, I had the opportunity to meet Byron Pitts, an Emmy-Award winning broadcast journalist. Broadcast news is still at the top of how most Americans get their news, but TV is no stranger to job loss. 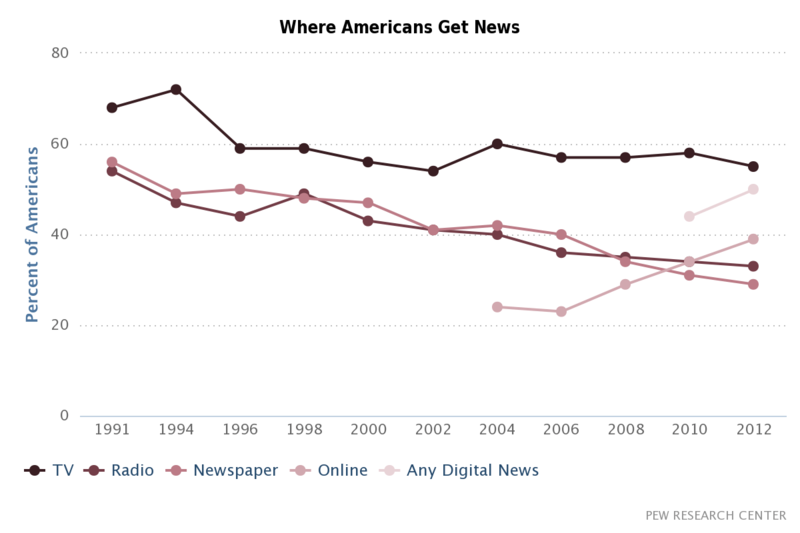 Recently, the percentage of Americans that get their news via TV has declined. As the below chart shows, online and digital news percentages have already surpassed newspaper and radio. If these media continue to rise even steadily – and experts agree that they will – then online media will dominate how we get our news. I’m ready for that. Pew Research Center. “In Changing News Landscape, Even Television is Vulnerable.” September 27, 2012. So journalism isn’t going away; The medium is simply changing. Journalists will always be in need and Pitts agreed. Pitts made it clear that storytellers, journalists, reporters – our jobs aren’t going away. They’re moving. Journalism is evolving. I’m just glad I get to be around as it happens.